The first thing you think when you meet Beth Gallagher is “charisma”. There’s no better word to describe this actress’ constant quips, jokes and overall ENERGY. Gallagher, playing Amelia Earhart in American History Theater’s Fall Season production of “Amelia Lives” has only been acting for a few years, but loves it. She’s silly, she’s funny, but most importantly…she’s good. The same energy she uses to give you the giggles is the same alluring energy she uses to get to the root of a character and bring out the most emphatic portions of the roles she plays. She has an ability to disarm you and connect with you easily when you meet her, and that ability comes in handy as performer. “Honestly living a truthful moment with another person on stage, or truly connecting with the spirit and circumstances of a character are what keeps me coming back (as an actress),” says Gallagher. That incredibly important and meaningful connection is what gives her a deep appreciation for the art of theater and for the art of telling a story through the performing arts. 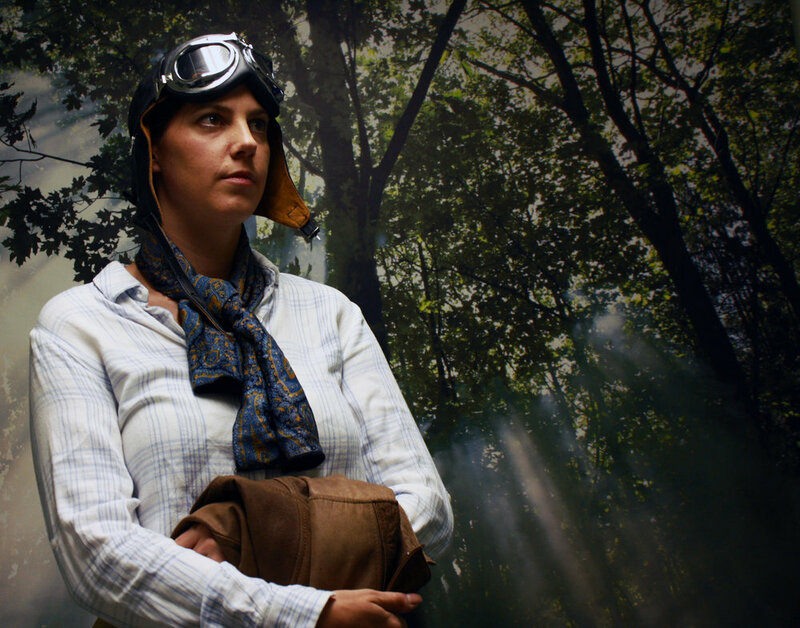 For American History Theater’s Fall Season, opening Sept. 24 at The Women’s Museum of California, Gallagher will play Amelia Earhart in the play “Amelia Lives”. Gallagher’s research into the role provided her with some pretty interesting personal insights about the plane-flying pioneer. Gallagher hopes that through her portrayal of Amelia, audiences take home a few basic things. In true Gallagher fashion, what she really wants is for the TRUTH of the character to be set free. “Amelia Lives”, directed by American History Theater’s own board member, Melissa Malloy, will be accompanied by another play about a strong woman icon, Zelda Fitzgerald. Zelda is the famed wife of author F. Scott Fitzgerald, but was a writing and artistic powerhouse in her own right. American History Theater is partnering with The Women’s Museum of California for its second season as they work to bring the stories of strong women to the stage and inspire audiences through the arts. The Women’s History Theater Festival’s aim is to bring the strength, struggle, triumph and love of our nation’s historic women to this stage for two weekends in a row.